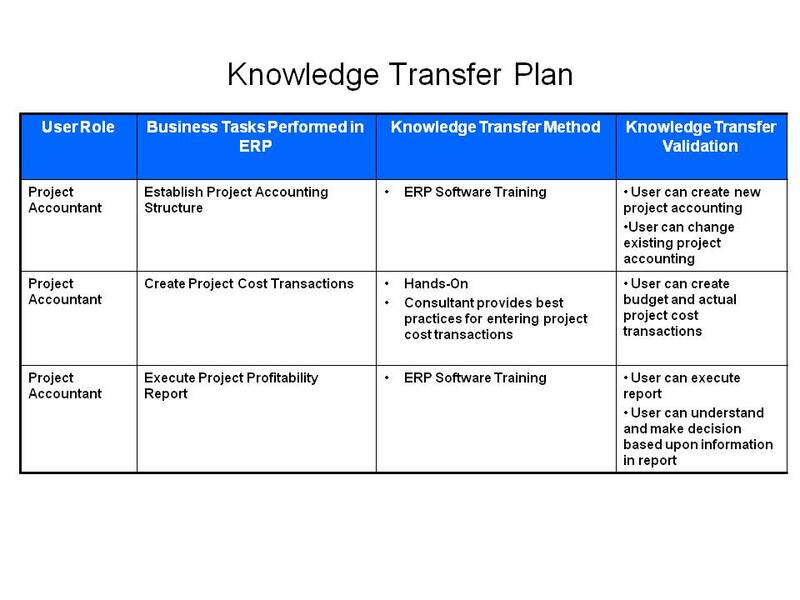 Customers – Insist on an ERP Knowledge Transfer Plan | ERP the Right Way! How do you measure knowledge transfer? Customers – have you ever received a report or completed checklist that demonstrated the Implementation Partner conducted knowledge transfer? Knowledge transfer is a process, not just a milestone task on a project plan. Consider the following illustration to identify the importance of knowledge transfer. 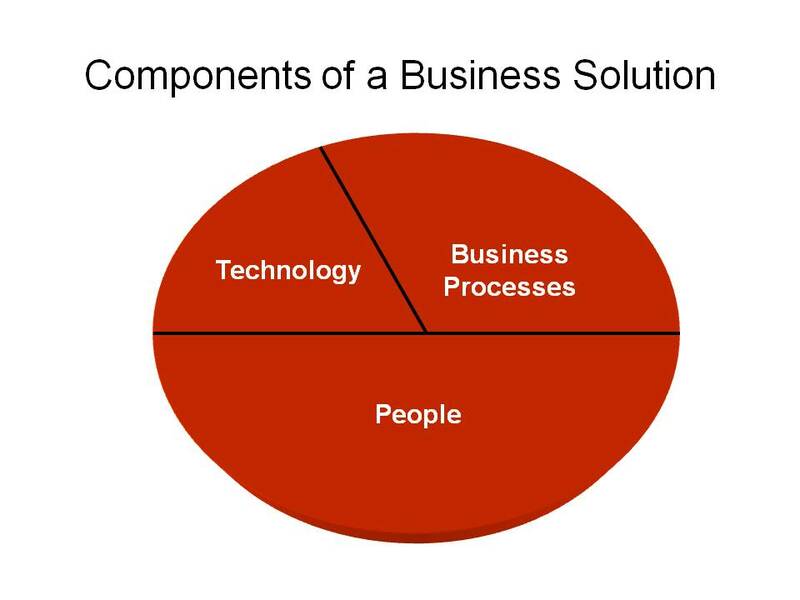 In a previous article I referred to this view and also identified people as the component with the largest impact to a successful business solution. A key enabler for people being successful is Implementation Partners conducting effective knowledge transfer. For many ERP implementations, knowledge transfer is a process that is loosely managed which results in the Implementation Partner providing support long after the go-live date. For an area so important it demands that we formalize this process to ensure completeness. Simply put, if you want to ensure that an objective is reached then you need a plan. A knowledge transfer plan first defines the knowledge transfer process and the methods that will be used to conduct knowledge transfer. Second, it defines all the customer’s roles & responsibilities that are required to support the entire business solution – both from a functional and technical perspective. Third, the knowledge transfer plan should act as a checklist for each individual role validating that effective knowledge transfer has taken place. Following is an example of a knowledge transfer plan. Effective knowledge transfer is more than just training or having a user sit next to a consultant. It requires a holistic approach in using several methods (training, mentoring, knowledge generation, and interactions) to be successful. The end result of knowledge transfer is enabling the customer to support their new business solution. Knowledge is power! Knowledge can be money and a key source of competitive advantage for an Implementation Partner. For an Implementation Partner a key concern is balancing knowledge transfer to ensure customer success versus providing too much knowledge resulting in the customer terminating services early. It’s important for customers to keep in mind that knowledge sharing happens more freely in a trusted environment. There are two broad categories of service that an Implementation Partner can provide: staff leadership and staff augmentation. To achieve greater customer enablement Implementation Partners should play more of a staff leadership role during the implementation. Customers, there is a price associated with effective knowledge transfer. Also keep in mind that there are greater resource requirements (i.e. knowledge, experience, advisory) for staff leadership services. Price should not be the only consideration when comparing staff leadership versus staff augmentation services. True enablement is based upon customers selecting consulting firms that act as a true partner and not just staff augmentation. 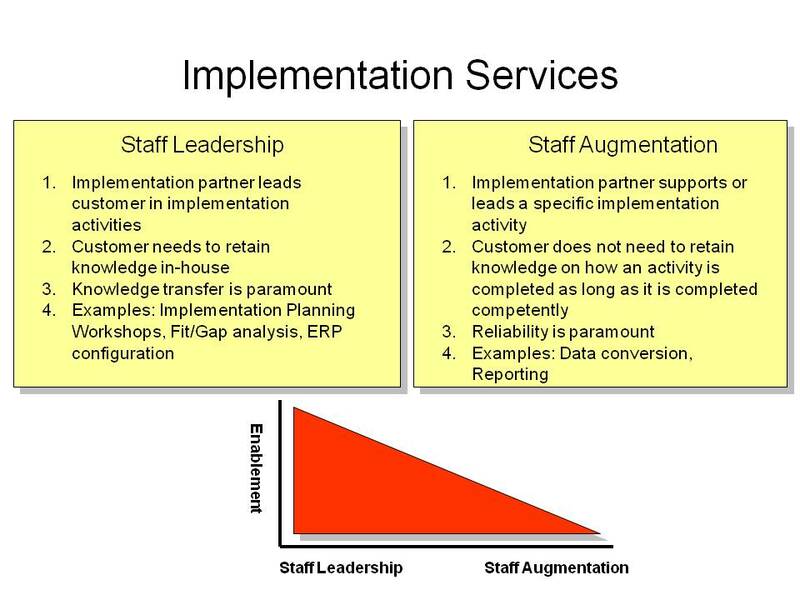 If customers only require staff augmentation then I suggest customers get it as cheap as possible, yet don’t expect any reliable knowledge transfer to occur. If this is the first ERP implementation for the customer then I would recommend that the customer selects an Implementation Partner that not only assist your project team but more importantly train and enable your project team to be successful on your own. That is what a true partner would do. To maximize knowledge transfer the customer needs to foster a trusted work environment. Customers – it’s in your best interest to take the lead in creating this environment. What we help Agresso users do is design and run their systems themselves so that when change inevitably happens, users are able to take control and readjust their own implementation processes to reflect the change that has occurred. A checklist doesn’t leave room for change. Our Agresso Implementation Methodology (AIM) is unique in that it passes ownership to the users much earlier in the process. We can do this as many of the changes in Agresso can be made by business users through the user interface as opposed to having to involve IT or programmers. That means business owners can take more ownership during and after the implementation. So how do you measure this? I think with Agresso our customers measure this by the fact that go-lives become a non-event as ownership happens much earlier in the process. Knowledge transfer is successful when customers can take ownership if their business and that ERP does not become a bottle neck to managing those changes and driving business in the way they want. Thank you Tirza for your feedback and insight. I agree with you that the more effective knowledge transfer is the less stressful the go-live is. Can we envision a day when post-production support is no longer needed because the customer is self-sufficent during the implementation? It’s a challenge that implementation partners should take to heart. Pingback: PeopleSoft Knowledge Map | ERP the Right Way!